The Strata Property Act came to effect on the 28th of July 2016. This act made it easier for strata property owners to wind up or dissolve their strata corporation by lowering the voting threshold to 80 per cent. Dissolving a strata corporation could be beneficial due to many reasons. As strata properties reach the end of their life cycles, they require more frequent repairs and more expensive maintenance which the property owners may not be willing to pay. As developers look for new development opportunities, aging strata buildings become appealing assets. As a strata owner you could get top dollar for your unit in this case. However, it is important to note that winding up a strata corporation is a complicated process and you must take advice from a reputed property agent and a lawyer to take you through a successful wind up. The physical condition, zoning and the potential for rezoning for each strata property is unique. It may be made of a diverse group of owners too. Make sure that your stake holders understand that you are in a wind up conversation and will need their support and cooperation so that you can achieve your goals. The key owners and the strata council members must understand the wind up process thoroughly. Informational meetings are essential so that everyone is well informed about the proceedings. Invite advisors and experts to these meetings so that all doubts can be cleared instantly. Overall, ensure that the right information is provided to the other owners and tenants. The distribution of the proceeds is determined by the Strata Property Act and the legislature that was prevalent prior to this act. The distribution of the sale proceeds should be determined early in the process. The inability of the strata corporation to force owners to sell their units before the windup process is complete must be addressed by the wind up agreement. The wind up approval process must be reflected in the agreement. Approval by the owners, the court and the due diligence process that is required by the developers must be accounted for. The nature of marketing selected and the timing for sale might be different for different kind of properties. There may be just one logical buyer willing to pay a premium amount for the property, or there may be many buyers. It is hence essential to choose the right real estate agent for this purpose. Appraisals from professional appraisal firms may also be required in some cases. The winding up of a strata property could be a long and stressful process that requires strict adherence to the Strata Property Act. It’s important that you seek authorization before marketing your property. You must provide further information to the owners on the current and potential zoning. In order to accomplish this, ensure that you work with your real estate brokers and appraisers. They can help you understand the timing and the realistic potential of any re-zoning so that your strata captures it’s fair share of that potential. Work closely with the Land Title Office staff and be sure to look for lawyers that provide the software and precedent knowledge to help expedite the process and achieve cost savings. If you are think of buying or selling in West Vancouver, call Naz Allahyari for a free home evaluation today. With historically low mortgage rates, fairly easy financing and price increases that have averaged more than 25 per cent annually and high demands for rentals, Metro Vancouver condominium investors have had it good for the past two years. But times have changed and investors need to operate in a much more risky market and discipline has become even more essential. It all started when the provincial government virtually banned the assignment sales on the resale housing. The condo sales instantly saw a 20 per cent drop from the previous month in Vancouver. In August, the 15 percent foreign buyer tax was introduced and in October, there were restrictions on the buyers purchasing with mortgage insurance (this included many first time buyers). Another essential factor that changed was the condominium sales across Metro Vancouver that were down from 30 per cent to 45 per cent. Yet, for investors with the financial capacity, this change is good and almost the type of market they have been waiting for! For example, there are more listings on the market, multiple bids on choice properties are rare and vendors are more open to negotiations. While it’s not exactly a buyer’s market, there a numerous advantages for the buyers to leverage from! So, where must investors purchase and what exactly are the opportunities in Metro Vancouver? Investors must look for condominium markets that have remained robust and that have a strong potential for rentals and appreciation over a period of time. This market saw robust sales earlier this year and will probably take some time to return to that state. This in fact is god for buyers who are looking for purchasing without the need for insurance. The most promising areas to be buying are Burnaby and New Westminster. These two zones have emerged as promising markets for purchasing real estate. Also, this year, there has been a steep rise in the number of condos that have started in Burnaby than in any other municipality. Moreover, the opening of the sky train extension this year has benefited Burnaby and New Westminster markets by enabling rapid transits. Prices are low and the number of buyers for condominiums has increased recently. In this changing environment, there are a lot of opportunities for home buyers and real estate investors. It is however essential that you have the right kind of guidance to select your target, negotiate the price and ensure that you have a fair down payment while you purchase. Well, get all your facts and figures in place and ensure that you invest in the right kind of real estate at the right time. Hiring a professional realtor could help you strike the right deal at the right time! The time is definitely good NOW – to invest in Metro Vancouver even though the lending rules have tightened and making sensible purchases in the condominium markets is a no brainer investment play! Naz Allahyari, is a full-time Vancouver Real Estate Agent specializes in Selling Property in West Vancouver, Coal Harbour, and Downtown Vancouver. As per the announcement made on October 3, 2016, by the federal finance minister, all Canadians applying for a mortgage that requires CMHC insurance will be required to qualify under higher interest rates. This is essentially termed as the stress test and includes tougher mortgage rules that are essentially a part of a broader set of ‘preventive measures’ that are aimed at ensuring the long term stability of the real estate market. This new rule may also help reducing the risks involved. Currently, the stress test applies to some insured, variable-rate mortgages and insured mortgages with terms of less than five years. But from 17th October 2016, these rules will also apply to all new applicants for insured mortgages. This essentially means that even if an applicant is eligible for a discounted mortgage rate of 2.79 per cent, they will need to qualify as if they would have to pay the Bank a rate of 4.64 per cent which is currently the full posted rate. What about those who have an existing insured mortgage? It’s good news for home owners with an existing insured mortgage or for those renewing an existing insured mortgage. They will not be affected by this new rule. Applicants for uninsured mortgages are also not affected. These announcements were made with an attempt to level the play field for the eligibility criteria for mortgages which is currently less stringent, especially when applied to applicants with less than 20 per cent or more down payment – generally considered as a low load to value ratio mortgage. Another important step that impacts the real estate market directly is the closing of a tax loophole for foreign real estate speculators to prevent foreign buyers from purchasing a property and selling it again within a given year and in turn failing to pay capital gains tax on that sale. Under the new rules, all tax payers will be required to declare income tax returns for the sale of a property which they claim as their primary residence. In order to quality, they must have lived in the given home at some time during the year. This change will ensure that the principle residence exemption is used only by Canadians and they will be required to declare one property as their principle residence for the same. The last point that was a part of the October 3rd announcement was about the appropriate sharing of the mortgage risks in case of mortgage defaults. Morneau however said that the housing market is pretty stable already, but the changes and new rules will ensure the long term stability of the market. It will also provide some amount of risk – protection as Canadians invest in the real estate market. And finally, it will ensure that the risk is appropriately shared between the government, the financial market and the Canadians. There are speculations that this new rule will be both good in some ways and might take some people out of the real estate market too especially with the ever increasing prices in the real estate market. The actual results are yet to be seen, observed and analyzed! Naz Allahyari, is a full-time Vancouver Real Estate Agent specializes in Selling Property in Vancouver, Coal Harbour, and Downtown Vancouver. Real estate crowdfunding is a relatively new approach for making finances available to develop a property, buy it or fund a real estate project. Generally a group of investors team up to provide the equity or debt required to buy or develop such real estate. This is generally done via an online platform or an online portal that is convenient for everyone. Crowdfunding comes across as a term used to raise donations for people in need or for some noble cause. But crowd lending is a great option to quickly raise the required equity. Real estate seems to be a great market for those looking for crowd funding and raising capital. Especially in Canada, more than $2.6 billion in global real estate projects were crowdfunded in 2015 even though the market has evolved at a much slower rate than the U.S. So, what exactly is driving this growth? The massive growth of mobile and electronic transactions as well as social media adoptions and securities laws that have become more liberal, all have contributed to the growth in the real estate crowd funding concept. A recent example includes the Start up Crowd Funding Exemption. This enables project owners to raise $250000 two times annually and retail investors are allowed a maximum of $1500 per campaign. What type of Real Estate can be crowdfunded? In the U.S. such kind of funds has been used for residential property development mainly multi family buildings. Investors are also interested in funding renovations of real estate that is in too much despair. Commercial real estate is also another area of interest for Crowd Funding. The main benefit here is to approach and seek community support for projects that may not have received enough acceptances in the past. The other good part is that the investors can select their specific properties of interest. The opportunities in this area vary in terms of risk and rewards and the commitment is always long term. The good part is that this investment is backed by the asset itself or the project that is invested in. Debt liquidity is known to vary from six months to over five years. Equity investments have a liquidity of three to ten years. Overall, the big boom in the real estate market is the main reason for the increasing wealth of home owners, developers and investors. Lack of capital or the skyrocketing prices are some of the reasons why many people are not yet investing. Crowd funding is becoming a great means to invest in real estate properties, projects and development plans. It opens up new opportunities for investors who are willing to purchase real estate and require a means to raise the capital. Well, it is made easy by crowd funding portals and convenient for everyone involved. It’s not the same as selling your home. Strata properties are quite different. It is actually quite different where the paperwork is concerned. Let’s check out what it entails. One of the major differences in selling your home and a strata property is that the home is on the land that you sell too – with it. With a strata property, you could be selling the home with or without the land it is on. It is hence important that you understand what exactly you are selling along with the strata property. This is not as simple as classifying whether the property is a condo, townhouse or a fraction of a vacation property. Some residential properties are mixed setups that could also include commercial properties such as retail stores or restaurants. The paperwork is a little different than standard. It will definitely include all the standard paperwork with some additional documents for property disclosure statements. Other than this, all the strata owners will be required to provide detailed information prior to the sale. This is exactly why hiring the right agent or realtor could come in handy. He will be able to provide you with the detailed list of documentation that will be required for the sale of your property and will walk you through the process of acquiring them too. Strata corporations generally have specific rules regarding the sale of their units. Some of the corporations do not allow sign boards such as “For Sale” on the property. But with the right agent for your support this should not be a problem. You will still get the right price and the right customers! It is however recommended to hire an experienced realtor to help you strike the right deal for the property you are trying to sell. Make sure that you select an agent who has complete knowledge of the local rules and regulations for buying and selling properties. More specifically check if he has experience with strata property dealings. This will definitely help you if you are selling for the first time. Another important thing to remember is that selling properties is a year round phenomenon. There is no right season or right time. People buy and sell all year round. So do not wait around for the market to get better or the season to end or anything. Keep your searches going! It is observed that strata living is best option for those who want to live a maintenance free lifestyle. Busy professionals and older adults prefer such a living. The potential buyers for such a living are definitely high. It is up to the realtor to get you the right deal for the property you are trying to sell. Make sure that you have all the documentation in place and make sure that you follow all the rules and regulations as defined by the local governing bodies and you should have no problems selling your strata property! Selling Home in Vancouver. Naz’s speciality includes homes for sale in the Vancouver Westside, Burnaby, North Vancouver, West Vancouver, and as well as condos in Downtown Vancouver. Buying a home is a dream. Sometimes we fail to look at the reality. Buying a home in Vancouver is quite a task as history shows that the house prices have almost tripled over the past decade. The main reason for such a rise is the short supply and the ever increasing demand. The single family housing has pushed the buyers out of their limits and purchasing has become more and more difficult. The same goes for the condo market. But the only difference is that the condo market is slightly more affordable for the average person. Which only means that a decade ago, if you had bought a condominium home, you would have been better off – today it’s unrealistic if not impossible. However, real estate agents can provide you with proper guidance and can help you with locating the right kind of home for your family in Vancouver. Prime locations in Vancouver are very desirable places for buying a home especially of you are buying for the first time. It’s everyone’s dream to live in the vicinity of the beach in Kitsilano or near your workplace in Yaletown or in the East Van community. Real estate in these locations come with a price tag. The budget considerations for East side homes and the West side homes are very different. You will need to study the prices before you buy. Understand all these factors and then look for the right home with the right kind of budget that suits you. Check out all the neighborhoods. Some neighborhoods might not seem very convincing at the moment. They might even seem unattractive to you at first. But remember, times change and you need to look at future prospects and study those. A real estate agent will be better equipped to help you out with such details. For example, Main Street was a prime area for drugs etc. over a decade ago. Today, it is one of the most desirable locations to purchase homes in. The West side of the city is well established. But the downside of this is that first time buyers find the price tags on the higher side. Rather than living on rent, buying real estate is always considered as a better option. It is a better financial decision. To begin with, you may feel your bank account drain off, but it will be worthwhile after a few years. On the other hand, if you keep renting, you are any ways paying a recurring amount per month. With buying you will build an asset that will be yours after a few years. Only consider the time and the market statistics when you decide to purchase. The local market prices for properties are continuously rising and falling. The good news is that – you need not do all the homework yourself. There are real estate experts who already have the knowledge of all that’s going around in the market and can give you good advice for buying and selling properties in Vancouver. 2015 saw a massive rise is real estate prices. Sales were skyrocketing and the overall market was bustling with activity. 2016 is already here and experts are already contemplating whether this will be a year where the market will see a cool down or an upward trajectory. 2015 was a real estate friendly year and the home sales in BC rose more than 21 percent as compared to the previous year (2014). This activity however is predicted to moderate in 2016 and the sales across the province will drop by around seven percent. The reasons for such a downward trend are the cooling off in the demand for purchase and also the non availability of real estate listed for sale. Other than this, there is a possibility of rise in the interest rates. The overall unit sales growth may be slow, and the total transaction dollar volumes will likely soar high due to the increasing demand and the low supply of the single family homes. Real estate demand from overseas buyers is not foreseen to cool down in 2016. It has been observed that the large detached houses get snapped up has homes or investments and foreign money will see an inward flow in the areas of commercial and recreational real estate. Recent studies have shown that foreign investors have shown increasing interest in resorts, vineyards, commercial properties and recreational real estate as well as multifamily accommodations. In 2016, it is also predicted that there will be a demand for single family home and more and more buyers will turn to condominiums. New Westminster municipality has demanded a minimum of 30 percent of new condos must have a minimum of two bedrooms and a minimum of 10 percent of new condos must have three bedrooms. Real estate developers were initially not very convinced with this decision, but this decision definitely provides affordable living for single families. The real estate market at the beginning of 2016 looks good, yet cooler than 2015. Smaller homes and lower income buyers will definitely benefit from the new rules and lower prices. It’s also a good time for foreign buyers and for those seeking to purchase a single family abode. The condominium market will steadily rise and you will see many affordable buying options. It’s a time of transition for Canada’s real estate markets. Find Vancouver Real Estate Listings by Naz Allahyari – top Realtor® in Vancouver. Is selling your home in winter a good idea? Many misconceptions and myths revolve around winters and the properties market. Is it a good idea to list your property for sale? Will you get a good price? Isn’t spring time a better option when the flowers are in full bloom and the property looks great? Even banks see a lot of loan applications for real estate during the spring time. It seems like most of the people are looking for property to buy during spring time. All these notions lead to one thing – people wait for a long time to list their property for sale and hence suffer losses! Firstly, let’s understand that weather does not have anything to do with the sale of your property. It is also important to understand that in a buyer’s market, that is, when the supply outweighs the demand , it probably may be a good idea to sell when the property ‘looks’ the best. On the other hand in a seller’s market where there is a good demand and supply is scarce, weather cannot be a factor for deciding when to list your property. Statistics show that over the past year, inventory for real estate in Greater Vancouver is low and the prices continue to rise since last winter – that included the spring too – until this winter season. Prices of properties keep rising exponentially and the weather or seasons have no impact on those whatsoever. Let’s take a look at a very common case, as experienced by many realtors. It has been observed that when owners wait until spring to list their properties, face negative consequences due to the extended wait time. For example, one seller waited until spring to list their property thinking that the street leading to their unit will make it look more appealing to the buyers. But, until spring there were other units in the same building that were listed for sale too. This created a very negative impression in the minds of buyers. They thought that there might be something wrong with the entire property and that’s why people are putting it up for sale. And there were lots of options for buyers too. So the property could not get a good price too! It took a long time to sell with a huge compromise on the price! The point we are arriving at is that the whole market revolves around the supply and the demand. It’s not about spring and winter. In fact if it’s winter and you are listing your property, chances are that buyers will have fewer options to choose from and you might get a great selling price too! Remember that even if you wait, buyers are always looking for property – even if it is winter. You are missing out on important opportunities. The lower inventory in winter might actually be good for your home because there will be very less competition! Overall, make sure that you list the property when you are ready to sell – not when the weather is perceived right! Buying or Selling your home or condo? Naz Allahyari is a top Vancouver Realtor for North Vancouver, Yaletown, West Vancouver and Downtown Vancouver. Moving to new neighborhoods could be an overwhelming decision. It’s always best to do your research before taking a decision and making the move. While it’s always a good idea to locate real estate agents in that locality to give you a clear picture of what you are getting into, you could do some research yourself and understand the pros and cons of moving to these new places. Neighborhoods are never problematic; its individual preferences that create conflicts of choices and make them seem like uncomfortable or displeasing to live in. So the topmost priority is the buyer’s choice and comfort level with the neighborhood. Some buyers are looking for home maintenance and surrounding areas that are well maintained for their family to move into. It gives you a sense of pride when you drive around your neighborhood and find it well maintained and clean! Also good points to consider are, whether the neighborhood has parks nearby or businesses nearby or some other things that make you either comfortable or uncomfortable. This could greatly influence your buying decision. Look for real estate which still has not crossed the ‘affordable’ mark and yet has a growing community. Your best bet for getting such information is the local agent because they are around the neighborhood more often and know all the projects in and out. Each family has different needs. So, even if you have consulted a real estate agent, you need to do some research on your own. Talk to a few neighbors. Read up on the internet and find out all that you can about the locality that you are considering buying a home in. Only you will be able to tell whether you get a good ‘feeling’ about the neighborhood or not. Other important factors that you should be looking for are the upcoming developments in that area. This greatly impacts the prices of homes there. Other than prices, it also impacts the quality of life in that locality. For example are there any transit routes planned? Or is there an upcoming business center planned within a short distance of the locality or any other such issues? One important source of information are the actual neighbors living in that locality. They can tell you how long they have been living there or how long they plant o live and why. Also, if there are any neighbors leaving, you will know why. It’s a good idea to take opinions from at least 2-3 neighbors before you finalize your plan. In the end, however, do not let other’s opinions overshadow your preferences. Make sure that you match your requirements with the offerings of the neighborhood. There will always be differences of opinions so understand how you really feel about the place and then gather facts and finally take the big decision of buying that property! As for investing or moving up, it is best to consult a Vancouver Real Estate agent before you make the move and decide. There is a continuous demand for property in Metro Vancouver real estate according to the Real Estate Board of Greater Vancouver (REBGV) data released on 5th October. The annual rates have slowed down in the recent months. However the sales of homes in the past few months have been between 25 and 30 percent above the 10 year sales average according to the president of REBGV. 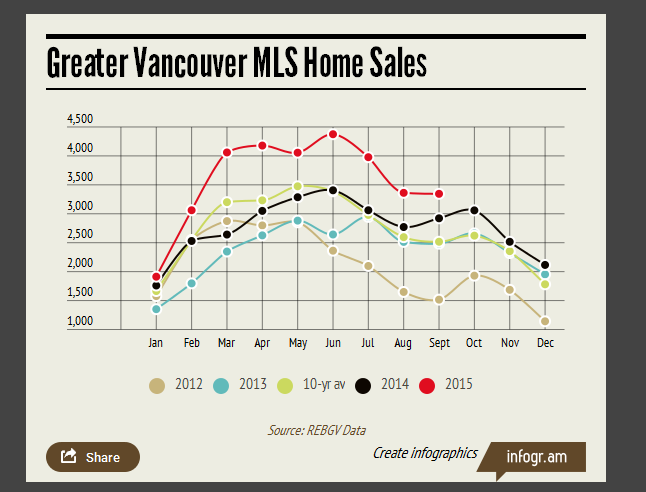 There was also an increase in Greater Vancouver home sales as compared to last year. If the data on home sales is analyzed, the detached homes saw a slight rise in sales compared to that last year. However the condo-apartment sale saw an increase of about 28 percent as compared to last year. This shows the shifting trend which means people prefer to stay in the urban areas rather than the detached homes. The sale of townhouses also showed an increase as compared to the sale in the previous year. There are many factors that affect the sale of a house which includes the overall maintenance of the house, the features – both outdoor and indoor and the cost of the house. Buyers are looking for a house that is ready to be moved in to, without spending on repairs or maintenance. The resale value increases if the house in well-furnished and well kept. In Metro Vancouver, new listings have shown a drop this year by around 7 percent. The main reason for this is that sellers are waiting for fall, to put their houses on sale. Since the homes listed for sale is not keeping up with the demand, there is an upward pressure on prices especially the detached homes. The sellers’ market conditions are strong and prices may tend to rise. The benchmark price for residential property in Metro Vancouver has been set to a new record, that is, it has risen around 17 percent as compared to last year. The detached home price has also seen an increase this year with about an 18 percent rise as compared to last year. These homes are having an increasing demand and the rise in price reflects the shortage of supply. The condo-apartment prices have also risen by around nine percent and the price of these homes is accelerating as the demand for these homes is increasing. The townhome, an attached unit and other types of homes have seen an increase in price as well by around eight percent. The home prices vary widely across the region and there is an increasing demand for homes but the listings for sale do not match the demand. Due to this, the prices tend to rise and vary from region and region. It also depends on the type of house, that is, a detached home or a condo-apartment or a townhouse. To summarize the market, we can say that there is a demand for detached homes showing the moving trend towards urban living and the shortage of such listings indicating a rise in the prices.